The Richmond Marathon is hands down my favorite marathon. It was my first (and third) and therefore it’ll always be special to me. This year marks the third year in a row I’m going to Richmond to race. However, this year since I already ran two marathons last month, I’m running the half marathon. I have a number of friends racing Richmond as well this weekend and I thought I’d offer up a few tips for running Richmond. These are all based on things I learned over the past couple years and while some tips are marathon specific, a few are more general. If you’ve raced Richmond before, add your tips for running Richmond in the comments! Plan for all weather scenarios. The weather has been different every year that I’ve run Richmond. In 2013, it poured (I mean POURED) at the start despite the forecast saying it would be clear skies. That resulted in me running the race with wet socks (I don’t recommend that). Last year, it was unexpectedly chilly. I haven’t even looked at the weather for this year’s race because I’m just bringing a few different options. It’s November on the East Coast. Be prepared! Plan your fueling based on the stops provided by the course. The Richmond Marathon is great because there is water and Powerade every two miles up until mile 20. At mile 20, you get a water stop every mile. I always carry my own water because that’s how I train, but knowing that in the later miles, there is water every single mile is a great motivation to just “get to the next water stop.” Also, there is junk food at miles 16 and 22 (I have never taken food there but the small sips of coke always are perfectly timed!) and wet washcloths to get the salt off your face and miles 17 and 23. Definitely things to look forward to! Remember your relative position to the river. The marathon course crosses the James River twice – first during mile 7 (right after the first party zone with lots of music and TONS of spectators) and then again during mile 15, right before the mile 16 junk food stop. I’ve always looked forward to getting over the river that second time because you are finally back on the “right” side of the river. And it means you’ve crossed the only significant bridge of the race. There is something about bridges that makes them so tough to run in races. Getting over that one is a good thing! Be on the lookout for running celebrities! Last year I saw Bart Yasso twice during the race – and got to hi five him both times. I’m not sure if he’s planning on coming back this year, but it’s always fun to see running celebs during races! Take in your surroundings. The crowd support during the race is fantastic! The only real “dead” zones are after that first time you cross the river. However, what that section lacks in spectators in makes up for it in natural beauty. You are running with the river to your left and it’s simply gorgeous. Take it all in. I remember very vividly how much I enjoyed all the course support. Maybe consider only using your music during the quiet miles by the water. Remember to save a bit for the downhill finish. All of the Richmond races (8k, half and full) finish on a steep downhill. I’m looking forward to experiencing this after 13 miles because after 26.1 miles that final .1 downhill hurt. I remember feeling like I was going to just roll down the hill to the finish line. I think it’ll feel way more awesome after just running the half, rather than the full. Regardless of the race you are running, save a bit of energy to really fly down that hill. Just try to protect your quads – if you are anything like me, downhills can shred your quads so be careful! Enjoy the afterparty. One of my favorite parts of running Richmond is hanging out after the race and enjoying the day. Take your finisher’s blanket (also known as your new favorite race premium), spread it out and chill. Grab a beer and a slice of pizza and you’ll be good to go! I am so excited to head back to Richmond! If you’ve raced Richmond before, share your tips in the comments! Who will I see in Richmond this weekend? Check back this week for my goals for the half marathon! Great tips! The weather is looking absolutely perfect right now!!!! Ahhhh! See you Saturday! Jess @ Jess Runs ATL recently posted…RICHMOND READY! I ran the marathon in 2012 and it was indeed perfect–everything you said is spot on. I’m doing the half this weekend, too! Have a great race!!! Woohoo, have a great time – say hi if ya see me out there! Sarah @ Sarah’s on the Run recently posted…MARATHON WEEK! Woohoo – you will love it. Richmond is a great race and a great first marathon!! Enjoy every second! Great tips about the weather! This will be my fourth time to run Richmond and every year the weather has been different! Running Richmond is so much fun! Agreed – I love this race so much! I have done the Richmond Half and have watched the marathon numerous times (I live off the course), but this is my first year running it! I am PUMPED about the weather and can’t wait to run Richmond! The course is a good mix of uphills and downhills and my training team has run the whole course through various training runs. I will also be at the expo helping out! I can’t wait!!! Oh Robyn that is SO exciting! I’m so happy for you – I hope you have an awesome race. I’ll be cheering between miles 24-25 after the half so look for me!! Courtney, I promise it’s going to happen, one of these days; I’ve got to get one of those blankets!! 😉 This is so great for folks running in the race; so much useful information and I know everyone will enjoy it. Hope you have a great time!! Thanks Tara – I’m thinking I might want to go back to Richmond for the full again next year. Haha, I just love that race! ahh I LOVE that premium! I’m traveling this weekend but one of these days I’m gonna run Richmond! woohoooooooo!! can’t wait to cheer you on! Looking forward to meeting you and cheering you on Saturday! It’s gonna be a great day! Thank you so much for sharing these tips! I’ve ran the 8k twice and have done halfs in other cities but am running the full here in Richmond this year! It’s my first and I’m definitely nervous so every bit of information I can find is so helpful! Good luck on Saturday! Richmond is a GREAT first marathon – best of luck! I love this!!! I loved Richmond last year and am so excited (and terrified) for this year. The nerves are setting in. My 2 favorite things…the finishers blanket and the stops at every mile after 20. I didn’t even use all the stops but it is a total mental thing. Just get to the next stop I kept telling myself :). It really helped me I think! thanks for sharing these! I look forward to my first Richmond race! I’ve heard such positive things about Richmond. Great post and I’m glad you like the race as well. Ahhhh so excited!! Fingers crossed that the forecast holds because the weather looks perfect! Thanks for the reminder about the hill at the end- the first two years I ran it, the finish was different so I’m really looking forward to it. And if worse comes to worse, I’m with you- I’ll just tuck and roll the last bit! 🙂 Have fun and hopefully I’ll see you to say hi! Hope you have a great day! I’m also crossing my fingers for good weather! Good luck on Saturday – I hope you have a fantastic race! I’m really excited for this even though I just ran MCM and the Chicago Marathon 2 weeks prior. Thanks for the tips I will definitely bring different outfit options for race day. 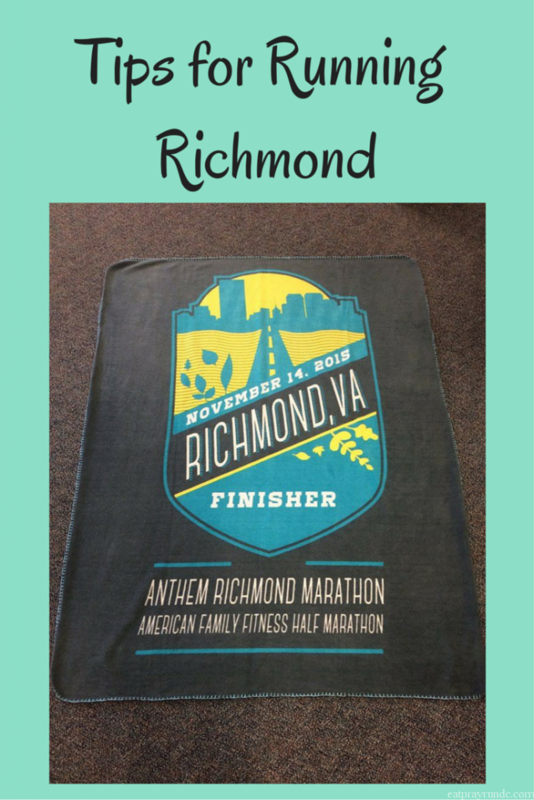 Have a great race – Richmond is awesome – you’ll love it!! Ran the full last year (loved loved loved it) but doing the 1/2 this year to change it up. There was a lady right before you approach the river miles handing out Kleenex…best thing ever those tissues were the best!!! Have a great race! Say hi if ya see me out there! So there’s Coke on the course? 16,22? That’s my go to late in the race. I can’t wait. I hope the weather holds out so we can have a nice dry day. I am running the full this weekend and it will be my first marathon! I’ve heard so many amazing things about this race and your post just made me that much more excited! Best of luck in the half!!! Maddie @ Dixie Runs recently posted…Hello there. Ran the full in 2011; looking forward to running the RIchmond half on Saturday! Can’t decide whether to wear my Oiselle shorts or Oiselle knickers. Decisions! We moved to RVA from Baltimore 5 years ago and I love this race! I’ve run the Half and Full and they’re both great. I hope everyone has an awesome time in our great city. If you get a chance stop by Hardywood Brewing (near the expo) and get some Gingerbread Stout to bring home! Thanks for the tip 🙂 Richmond is a great city! Have so much fun!! I need to do this race!! I would love to do the marathon in 2017!! Maybe the half next year! Hi everyone, fairly experienced marathoner here trying to analyze the course. Have been looking mostly for a “flat and fast” course trying to BQ. Can anyone speak to how significant the hills are on the Richmond course? Is the uphill from 16-18 a crushed? Thanks! Richmond would be great for a BQ. The hill is really around 19 and not that bad at all. I would describe the course as mostly flat with some rolling elevation changes.